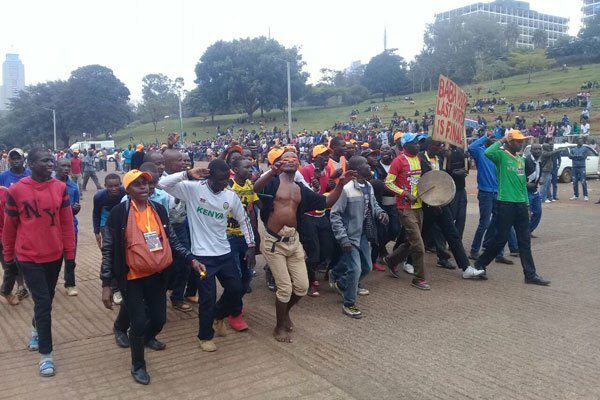 NASA supporters challenge Mike Sonko orders, stream into Uhuru Park forceful, Nairobi. #NASADemos - Bana Kenya News, Real African Network Tubanane. The big and major announcement that the NASA leader Raila Odinga was to make at the Uhuru Park goes futile after the Nairobi County Government said that the Rally called was illegal. Nairobi City County wants police to stop the National Super Alliance (Nasa) from using Uhuru park for its rally this afternoon. Nairobi Governor Mike Sonko had written to the county police commander Japhet Koome disputing booking of the venue by Nasa. He asked Mr Koome to secure the venue, citing “unauthorized meeting”. “It has come to my attention that the National Super Alliance (Nasa) leaders plan to use Uhuru Park Grounds today for a political meeting. However, records at City Hall show that they have not followed the procedures to secure the said grounds for their meeting,” read the statement to the police chief. “By the authority of this letter, kindly ensure no such illegal meeting is held against our authority and against the law,” he said. “It is, therefore, my humble request that you secure Uhuru Park Grounds unless you receive written authority and approval by the County Government of Nairobi over the same,” said Mr Sonko. The NASA supporters started to flock into the grounds where the major announcement was expected from Raila Odinga. Police have been ordered to evacuate and send away every person at Uhuru Park.